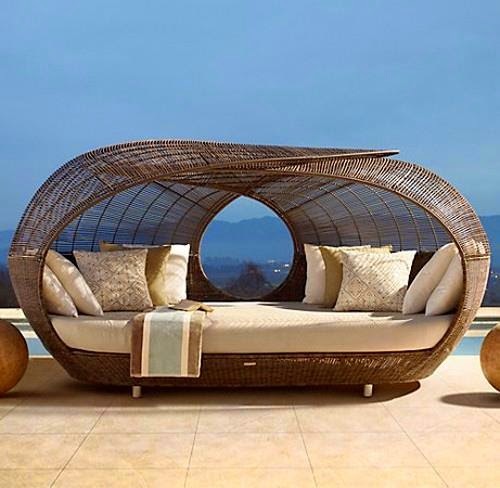 Internationally as well as domestically, Neoteric Luxury has continuously been the go-to designer and manufacturer of luxurious, award, winning outdoor furnishings. A favorite of luxury hotels and high-end residences throughout the world, Neoteric Luxury’s design philosophy emphasizes elegance and sophistication in outdoor furnishings. Our products are meticulously engineered and hand-crafted, using the finest, most superior materials, fibers and artisan craftsmanship intertwined like no other. Our dedication to the highest, unwavering and exacting quality standards results in outdoor furniture that is not only remarkable – but also designed to last. Neoteric Luxury is committed to using low or zero off-gassing materials. In addition, our wooden outdoor furniture line is created using recycled teak and various other woods from reclaimed sources. Aside from the extensive selections of our bespoke outdoor furnishings, we provide unique custom tailoring to seamlessly harmonize with the personal needs of individual owners. Most of our products may also be created for use in indoor environments using 100% natural products Gary Cardono - VP of Sales 401-595-2610 or gary.cardono@neotericluxury.com. We strive to establish life-long relationships in which we can be relied on with certainty and confidence to meet the needs of our customers. We are confident that our furniture will invoke a feeling of prestige, exceptional comfort and well-being.